When your little girl outgrows her footed pajamas and favorite dolls, you have to admit: she grew up. What exactly does that mean for you? Well for one, it means you should look ahead to a few changes, not all for the better. One of these changes being your yearly family retreat. If you have watched your dull teenagers in their hotel rooms listening to their iPods without leaving their rooms for hours and hours in some of the most unsurpassed all-inclusive resorts in the planet with striking swimming pools, food to die for, seas that inebriate you more than any wine, you probably know what I am talking about. These bizarre individuals, who asked for your attention years ago, now call for something else, something unusual, something that would make their hearts beat a little quicker and body temperatures take a sharp turn upward. Let’s leave these teens glued to their TVs and think for a moment. Do you have any ideas on how to make your family vacation a bit more exciting and than soaking in a pool, watching baskets being weaved, one strand at a time, and learning how to Hula dance in a Polynesian Cultural Center? I have something for you, but before that let's journey back in time to Odessa, one of the most beautiful cities in Ukraine. Why Odessa? Well one reason being Odessa’s notorious catacombs. Let me take you back 200 years. The city’s homes were mainly comprised of sandstone mined nearby. This fashioned a world underneath Odessa made of intricate labyrinths and underground passageways. These ‘catacombs’ stretched out to being approximately 2,500 kilometers making them the longest of either ancient Rome or Paris. The typical height of a tunnel is 1.5 - 3.5 m, and having a width of 2 - 4.5 m. The depth can reach 50 m beneath sea level. To this day, only half of these tunnels are studied and deliberated upon. 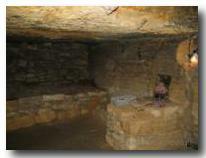 Because of these catacombs that span beneath the whole city and beyond, Odessa does not have a subway system. 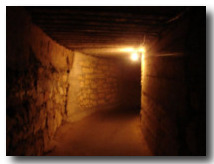 Catacombs were used and expanded by criminals. They were also used as a shelter for slave traders, who smuggled stolen women out of the Odessa ports to the slave markets of Constantinople. Eventually during World War II catacombs became a residence for thousands of partisan rebels. Odessa has almost no hills or forests so during the war these catacombs were the only places where partisan rebels could hide. The partisans used the tunnels as a base for attacking the nearby Nazi troops. There were five partisan groups and 45 other groups, a total of 6,000 people that maneuvered in these burrows. The excavated opening to the tunnels is found at the border of the city. The entrance is stunning, with colossal stairs cascading down from ground level. As you walk down almost immediately the lavishness of the entrance disappears, and the passages become small and constricted. The faint yellow dimming lights are now the only things lighting the way for those ready to experience Odessa’s world underneath the surface. It’s difficult to envision that only 60 years ago hundreds of people, including women and children, lived there for two and half years, hiding, barricading the entrances, sneaking food and water from the surface. Even to this day people occasionally find little pieces of history; weapons, hollow places inside tunnels that have been used as bedrooms or storages. As any unsettling place, catacombs have their own folklore. One of these myths portrays an influential man traveling aboard the Titanic. He was found by a rescue ship, and taken to Odessa. To thank his rescuers he made a small replica of the titanic in pure gold, and it was hidden in these catacombs. Many people still scour the underground for it using secret maps, but up to this day nothing has been found. Many people still believe in the story and who knows, maybe some of us will find this golden ship one day in the dark tunnels of Odessa catacombs. A different story tells about a God that lives inside the catacombs. He guards the riches. If one were to decide to leave with something to the surface, the livid god would punish them and they will never be able to return from the cold and dark. The obscurity and emptiness of these dubious catacombs surround the people of Odessa. It inspires them, heals their monotony and lonesomeness, and gives them a way of rethinking their own troubles that are measly and insignificant when you are underground so far away from other human beings and sunlight. Although now a days the catacombs have a sunnier disposition. The resourceful citizens have used them to come up with paintball games and rock festivals. After all, our ‘Ravenous’ God from underground doesn’t mind if you try new things; he does need some company. Finally, our travel through time is complete. Let’s approach our teenagers that we left in their hotel rooms once more. Let’s tell them about these catacombs, and maybe, a little trip to Odessa might just be the thing to break out of monotony. And after you are back from the underground the idea of hitting Odessa’s night clubs or spending couple of lazy days on the Odessa beaches will sound quite attractive!